Carlton defeated Essendon by 16 points at the MCG. Goalkickers: H.Turner 4, F.Davies 3, J.Baird 3, K.Hands 2, F.Stafford 1, J.Mooring 1. Best: F.Davies, O.Grieve, J.Bennett, J.Howell, F.Stafford, H.Turner, B.Deacon. Essendon started the game kicking with the benefit of a strong wind, but were wasteful kicking 3 goals 8 to one behind. Brownlow Medallist Bert Deacon and Ollie Grieve at fullback limited the damage for the Blues. With Carlton dominating in the ruck, the Blues kicked 7 goals to 3 in the second quarter to setup a close game by the half-time break. 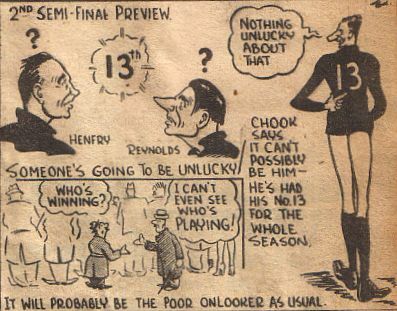 After an injury to Bert Deacon in the third term, it seemed as if the Blues might be in trouble, but Ken Hands started to dominate in the forward line. Mistakes by Essendon made it easier for Carlton in the last quarter and three quick goals, with Howell getting one and Hands two. The Blues had established a winning lead and went on to kick 5 goals to 1 in the last quarter to take out the match. This image is sometimes mistaken as from the Grand Final. Contributors to this page: blueycarlton , Bombasheldon , timmyd , sherb , WillowBlue , camelboy , steve , thehalford and admin . Page last modified on Saturday 06 of February, 2016 17:37:19 AEDT by blueycarlton. 1992 - Parkin and his tackle count (13/05/92). 1972 GF - A record.